Often, one’s first inclination about desserts for the wedding is to go to the most popular local bakery that specializes in wedding cakes and order a cake large enough to feed everyone at the reception. 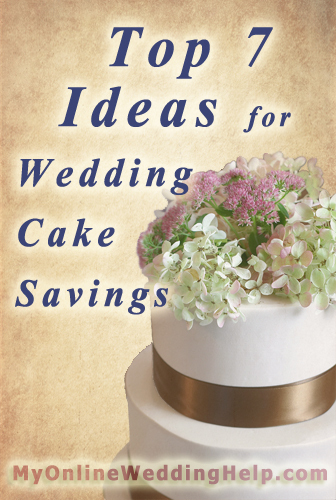 While you can be assured of plenty of high-quality cake, it may also cost more than you have to spend. There are a few different approaches to “having your cake and eating it, too,” so to speak. 1. In addition to the wedding cake, serve a second one with the same flavor and frosting but baked in a large rectangular pan (refer to it as a “sheet” cake when ordering) instead of tiered. Same cake, same taste, less cost. 2. Have additional desserts, as well as wedding cake, either at a separate station or as favors or centerpieces at the guest tables. Guests can choose the dessert they want. If you are worried too many will want cake, make sure to cut the cake into small pieces. 3. Choose butter-cream frosting instead of fondant. The more traditional “cake frosting” is easier to work with and requires less talent to make than the fondant-enrobed specimens you will likely see at bridal shows. If you do decide on fondant, think minimalistic and use color instead of design for a less costly yet still extravagant look. 4. Use real flowers, either to top the cake or between layers. For the latter, order the cake with space between the tiers (in essence, have them use a stand with a plate for each tier, leaving space between the layers). Then, before the reception, fill the empty space with flowers. 6. Decorate a plain cake with fruit, such as berries. 7. Instead of having the bakery replicate your wedding decor, carefully trim your cake with the real thing. Lace, ribbon, raffia, burlap, and reception decorations are all candidates for use on the cake (be sure to back fabric with wax paper to both protect the material from picking up grease from the icing and avoid contaminating your icing).